This Free YouTube Downloader is always compatible with YouTube latest upgrade. 4Media Download YouTube Video for Mac is a FREEWARE specially designed for downloading and saving videos from YouTube. This free YouTube downloader can download YouTube videos, even YouTube HD videos including 1080p and 4K videos, also works with 3D videos. So easy is it to download YouTube videos. By pasting a URL of your desired video on the software, then click “Download” button, a perfect video will be present in front of you. What’ s more, it allows you to set preferred resolution, format, save destination, and the max simultaneous downloads, bringing convenience to you. It also adds the function to automatically transfer MP4/MOV/MP3 files to iTunes. 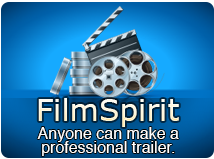 Easily and quickly download YouTube videos with different formats, such as, FLV, MP4, and Webm. It allows you to free download YouTube HD videos (even 1080p, 4K video) and 3D videos from YouTube to your Mac with fast speed. 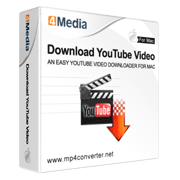 Download several files simultaneously in batches with 4Media Download YouTube Video for Mac. Convert YouTube and local videos to MP3, AVI, MP4, MKV, WMV, WAV, MPG, MOV, M4A, FLAC and FLV for playing on iPod, iPhone, iPad, Samsung Galaxy, Kindle Fire, Nexus, Surface Pro, Moto X, HTC One, Nokia Lumia. 4Media Download YouTube Video for Mac supports downloading videos in batch simultaneously, saving your time and efforts. You can choose to convert YouTube videos, HD videos (even 1080p, 4K videos) and 3D videos to MP3, AVI, MP4, MKV, WMV, WAV, MPG, MOV, M4A, FLAC and FLV. Users can customize preferred video quality, resolutions, video bitrate and formats, also can decide the max simultaneous downloads and conversions. This downloader provides the option for you to choose if you want to automatically transfer MP4, MOV and MP3 file to iTunes after downloading and converting. You can set your output file just for specified devices like iPhone, iPad, Galaxy, HTC One, Moto X, Nexus, Kindle, Surface, Lumia, etc. 4Media Download YouTube Video for Mac offers several languages: English, German, French, Chinese and Japanese.